If you already love to dance, you know how easy it is to work up a sweat on the dance floor. Far from the monotony of the treadmill, dancing is an exercise that engages not only the body, but also our creativity and sense of fun. Who knows where a dance will take you? When the music starts playing, it can feel almost like a trance: toes start tapping, hips begin to sway, and before you know it, you are creating your own moves that flow from within—no choreographer needed! Dancing can be a deep release that melts away stress and worry, while simultaneously delivering a great workout. Talk about a win-win! If you aren’t a dancer, or it’s been years since you have, learning about the amazing health benefits of dancing may be just the inspiration you need to get out on the dance floor! This article explores some of the ways that science has substantiated the mind, body, and quality of life benefits you can gain by adding this exuberant activity to your life. As we grow older, we experience an increased risk of age-related cognitive decline, evidenced by the onset of diseases like dementia and Alzheimer’s in elderly populations. It’s no surprise that the elderly experience the most marked improvements from dance therapy. Considered a “psychosocial” intervention, dancing combines a myriad of benefits into one activity: the mood-elevating effects of increased social interaction, along with improvements in brain function and quality of life. A recent study published in Frontiers in Human Neuroscience has demonstrated that while most forms of exercise slow-down age-related decline, dancing has even more profound benefits. Two test groups were created: one group underwent eighteen months of once-weekly endurance and flexibility training, while the other group learned dance routines. Both groups demonstrated increases in the hippocampus, the region of the brain responsible for memory, learning, and balance, and most affected by age-related decline. But only the dance group demonstrated noticeable behavior changes like improved balance. Researchers credited the challenging aspects of learning new dances each week to being in a state of continuous learning. Mastering new rhythms, steps, and formations, combined with increased social engagement, provided a boost to brain activity that created additional cognitive benefits for the dance group. Researchers were greatly encouraged by results, calling dancing “a powerful tool to set new challenges for the body and mind, especially in older age.” A new study is being planned to bring the combined power of music and movement to the aid of dementia patients. Other important studies on dancing have found additional benefits to cognitive function and quality of life among aging populations. A 2009 study of patients in a dementia care unit showed 67% of patients attending dance sessions with staff members experienced a significant reduction in agitation, one of the primary and most distressing symptoms of dementia. Participants also experienced uplifted mood and increased social bonding, signifying an overall increase in quality of life for these patients. A similar study, conducted in an assisted care home was motivated by the desire to treat depression often witnessed in elderly residents of such facilities. Researchers were seeking treatments that could also potentially improve the lack of desire and motivation that often accompanies depression. This type of layered, psychosocial condition is where therapies involving art can be the most impactful. Researchers noted that dancing sessions allowed residents to express themselves freely and creatively which had measurable impact on self-esteem. Residents also experienced relaxation benefits and emotional upliftment. This study concluded that dancing, along with other art therapies, can significantly improve cognitive functioning as they enhance overall well-being. Dancing for fitness has experienced a cultural boost in the United States thanks to the popularity of TV shows like “Dancing With the Stars,” where viewers watch as their favorite celebrities improve their moves while simultaneously shedding pounds. To witness these cultural icons whom we regard as masters in their respective fields, reduced to clumsy beginners when they attempt to dance is something many of us can relate to. We also get to share in their victories, as hard work and dedication give rise to grace and skill. Not only do many of these celebrities get into the best shape of their lives, they have an amazing time doing it! Their joy and developing confidence is so infectious, America can’t stop watching. The show has become a global phenomenon with audiences and spin-offs in 50 countries. But dancing is not a spectator sport! To experience the benefits, you have to get up, and get down! While dancing requires a certain level of fitness and athleticism to win competitions, there are no barriers to entry if you want to explore dance movement as a way to improve general health and coordination. In 2014, researchers sought to determine if dance therapy can improve exercise capacity and health-related quality of life in patients with chronic heart failure. As compared to control group, dance therapy imparted significant improvements in both overall fitness and quality of life measurements, leading researchers to suggest inclusion of dance therapy in cardiac rehabilitation programs. What if you don’t have a dance partner, and hesitate to go dancing on your own? Thanks to its growing popularity, there are more options than ever before to find an instructor-led class that appeals to you. Most gyms now offer classes in a variety of dance styles, such as ballet barre, where participants focus on flexibility and strength-building using the classic tools of the ballet. Hip-hop dance classes offer a more free-form way to move. There are dance classes that can help you connect to culture, such as tribal African dance, folk styles, and belly-dancing. Even the non-specific style of aerobic dance that is conducted in classes all over America offers health advantages over jumping on the treadmill. A 2007 study explored the benefits of aerobic dance as compared to a walk-jog exercise program. After eight weeks of engagement, both the aerobic dance group and the walk-jog groups experienced significant fitness benefits over the control group, leading researchers to conclude that an aerobic dance program is an effective alternative to a walk-jog training regime. As with all exercise programs, the key to obtaining optimal results is compliance. Finding a form of exercise that you enjoy is the best way to ensure that you stick with it! So if you’re bored with your traditional fitness routine, exploring a style of dance that appeals to you can be just the ticket to reinvigorating your commitment to regular exercise. According to the World Health Organization, more than 300 million people worldwide are affected by depression. With antidepressant medication use up by more than 400% in the United States, now more than ever, we need natural ways of stimulating “feel-good” hormones in the brain. Perhaps nothing can make a deeper impact on feelings of well-being and contentment than genuinely connecting with other human beings, and coming together through song and dance is one of our oldest human traditions. Dancing with someone lights up areas of the brain that stimulate a sense of oneness and connection, something scientists call “self-other merging.” And researchers are taking note of these therapeutic effects as a potential remedy for depression. A Korean study on adolescents suffering from depression found that young people who engaged in dance movement therapy reported significantly less psychological distress, and demonstrated improved emotional responses. Neurohormone levels were measured before and after 12 weeks of dance therapy, adding further supportive evidence to these findings. Serotonin concentration increased from dancing, and dopamine levels decreased, suggesting that dance therapy may stabilize the sympathetic nervous system. Researchers concluded that dancing may “beneficially modulate” these important brain chemicals, and improve emotional health in sufferers of depression. Dancing can provide an emotional boost when experiencing other hardships in life, such as a cancer diagnosis. A pilot research study was conducted in 2005 at two cancer treatment centers, exploring the effects of dance movement therapy on breast cancer survivors in their first five-years post-treatment. Outcomes were based on quality of life measurements, shoulder range of motion, and body image scale. As compared to the non-active group, the dance movement group showed significant quality of life improvements Shoulder range of motion also improved, as did perception of body image. Researchers stated that “The overall effect of dance training was significant” and larger studies are justified to include dancing as part of the continuum of care for cancersurvivors. The powerful healing effects of music and dancing are not exclusive to the hearing-enabled. A 2002 study sought to understand how dance and other forms of “esthetic education” could influence the socialization of deaf persons. Therapeutic dance instructors applied “choreo-therapy” to young, deaf persons for a period of one-to-three years, and a variety of socialization metrics were recorded. Researchers found that the students “participated with pleasure,” and the longer they danced (in terms of years), the better their social skills became. Motivations for their voluntary participation ranged from a desire to improve health (10% cited), to the opportunities for engagement with instructors (20%), to a sheer love of dance (70%). Improvements in social abilities included development of a more mature outlook, better grades in school, and improved conversational abilities. Students relaxed and became less self-conscious, developed better decision-making skills, and experienced more joy. And if you think that dancing is only for the bold, among these deaf adolescents, only 5% felt tired and discouraged by the activities. If you are bored with your regular fitness routine, dealing with circumstances that have you feeling down, or you just want to amp-up the joy in your life, dancing is an amazing activity, replete with benefits for mind, body, and soul. It’s something you can do with a partner, in a class led by a qualified instructor, or alone in your room with the radio turned up! 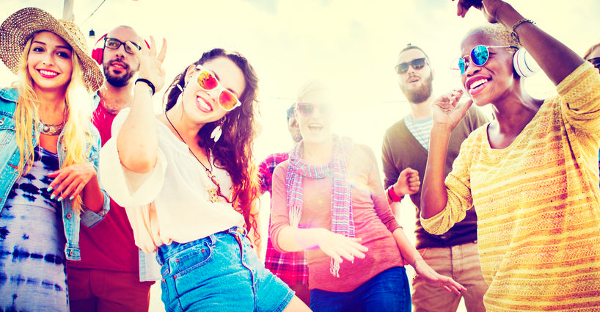 Whether you’re dancing fast or slow, alone or with someone, the therapeutic benefits of music, movement, and connection, are free and available to everyone. So turn up the music, and dance your way to a long, healthy, and happy life! 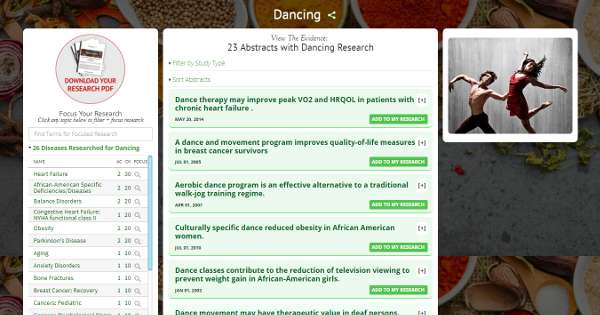 For additional research on the health benefits of dancing visit our database on the subject. National Center for Health Statistics. Health, United States, 2010: With special feature on death and dying. Table 95. Hyattsville, MD. 2011. The GMI Research Group (GMIRG) is dedicated to investigating the most important health and environmental issues of the day. Special emphasis will be placed on environmental health. Our focused and deep research will explore the many ways in which the present condition of the human body directly reflects the true state of the ambient environment.